I was a little concerned at first because they are supposed to be "wide" shoes; and they looked really narrow, but they fit great; they were easy to get used to (haven't bought new bowling shoes in over 25 years); and they're just comfortable. I like the price and I would definitely buy again. Would not buy this product from Bowling.com again. Had to return the shoes because sized small. Had to pay to shipping to return shoes, and they wouldn't be sent for 3 three weeks ($5.00 charge for exchange), since I needed them had to pay 15% of purchase price for returning shoes. Went to local pro shop and they ordered shoes and had them in 3 days at the same price as bowling.com and they had shoes to try on for correct shoe size. Would not recommend buying anything you have to have correct size if you need it quickly. like the bowling shoes I ordered a half size larger for my wide foot the shoes say wide width so to be sure they fit I ordered them bigger I compared them with other wide shoes I have an they are not wide I wore so have to keep them. Dont order if you have a wide foot. My feet used to hurt by the time I would get done bowling, but with these shoes I haven't had any more problems. Love them. By Jen from Otisville N.Y. The people who work there are very accommodating. They where a pleasure to speak to. I bowl with the shoes on of course. I wish they came in a wider width . Now I have two of shoes to wear but neither pair fits as well as would like for them to. Very stiff and not wide. I should have trusted the reviewer who said they weren't wide. Unfortunately they are a closeout and I can't return them. This shoe is a wide width shoe. To see other wide width shoes just type wide width in the search box at the top of the page. Hope this helps! Is the upper part of this shoe soft & not stiff? Hello Boni! 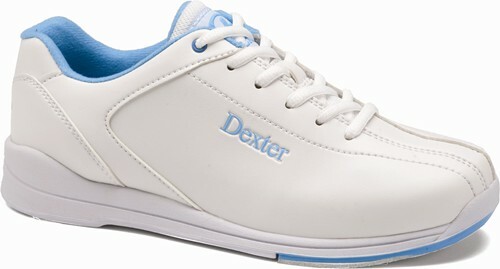 I have worn the lower end Dexter shoes for men and they are very comfortable. In the end, though, this will be more of an opinion, so I can't necessarily answer that question other than to give my opinion that I think the shoes are comfortable. My daughter wears a size 7 rental shoes. Do these fit the same as rental shoes? She wears a size 8 in regular athletic shoes. Hello! The Raquel shoe will fit more along the lines of a typical tennis shoe. This will have a separate tongue the full length of the laces and is connected at the end near the toe. There is a lace alignment on the tongue which should keep the tongue better in place when you feed the laces through the tongue. If you launder them, it could ruin the slide soles on the shoes. These will have S8 Microfiber Slide Soles on Both Heels. A mens 6 wide would be equivalent to a womens 8 EE. If it's the wrong size, am I able to return back and exchange? These will be a standard D wide width for women. Due to the time it takes to produce the Dexter Womens Raquel IV White/Blue Wide Width ball it will ship in 2 bus. days. We cannot ship this ball outside the United States.